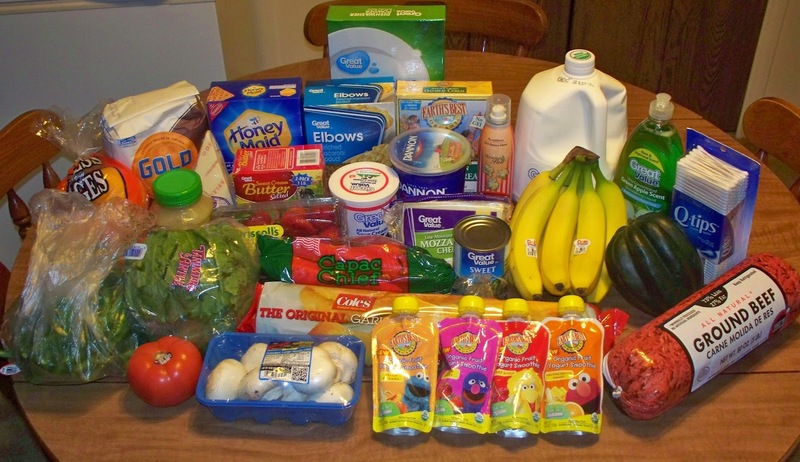 Our grocery budget is typically around $90 per week. When we have extra gas money, we will use that to cover anything over $90 that we spend. We had $103 that we could spend at the store; I anticipated our trip would be $98, but it came in significantly less at $91.18 (including 6% sales tax on applicable household items). I'm always quick to use Ibotta and Checkout 51 to get some money back from our grocery trips and I also need to check out Walmart's Savings Catcher app. For breakfast, I always have a banana, yogurt and granola bowl. Jason eats a piece of fruit and homemade bread, typically. Bug has a piece of fruit, a pouch of food, an egg or homemade bread. On an odd occasion, Jason will give green beans to her or something odd to us Americans. Lunches are typically leftovers. If there are not enough leftovers, Jason and Bug eat organic macaroni and cheese. We have several boxes of this in the pantry. Bug always has pouches of food, teddy graham crackers, cheddar bunnies, baby cookies and other assorted organic goodies in the pantry for her snacks as well.